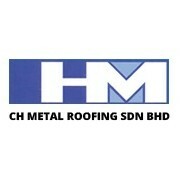 CH Metal Roofing Sdn Bhd was established in 2004, Producing high quality and premium coated steel roofing and wall cladding sheet. Our range of profiles include WINDKLIP, WINDECK I, WINDECK II, WINDCLAD and WINDECK CRIMP CURVE. With its unique design and great forming capabilities, thus making it the idea product to be used for roofing and walling application in varios kind of projects. And all the product is environmental friendly as it is fully recyclable. We are committed to continuous improve the product quality and services, to ensure each product deliver to customer with strength and durability. At CH Metal, we are ready to serve you better. No. 18, Jalan P 4/8, Bandar Teknologi Kajang, 43500 Semenyih, Selangor Darul Ehsan, Malaysia.